We use wood cutting boards a LOT in our house. 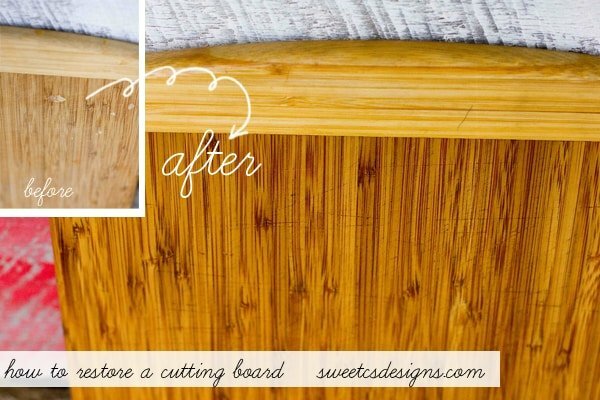 This tip for how to sanitize and restore a wood cutting board is one of our most-used tricks! 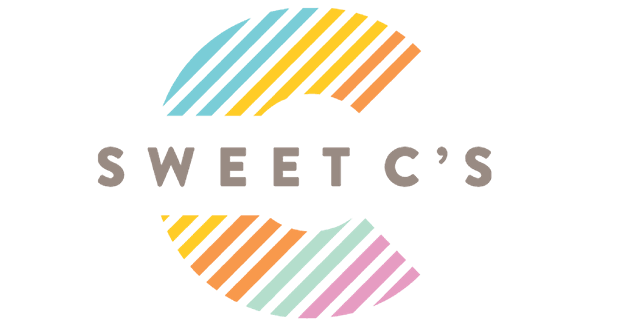 This post originally appeared on Sweet C’s in 2013 – and has been a huge hit ever since! They are easy, simple and beautiful. We even have a kitchen island with a butcher block table top that we use as our everyday table. So to say we need a good way to sterilize wood, without chemicals, is an understatement! 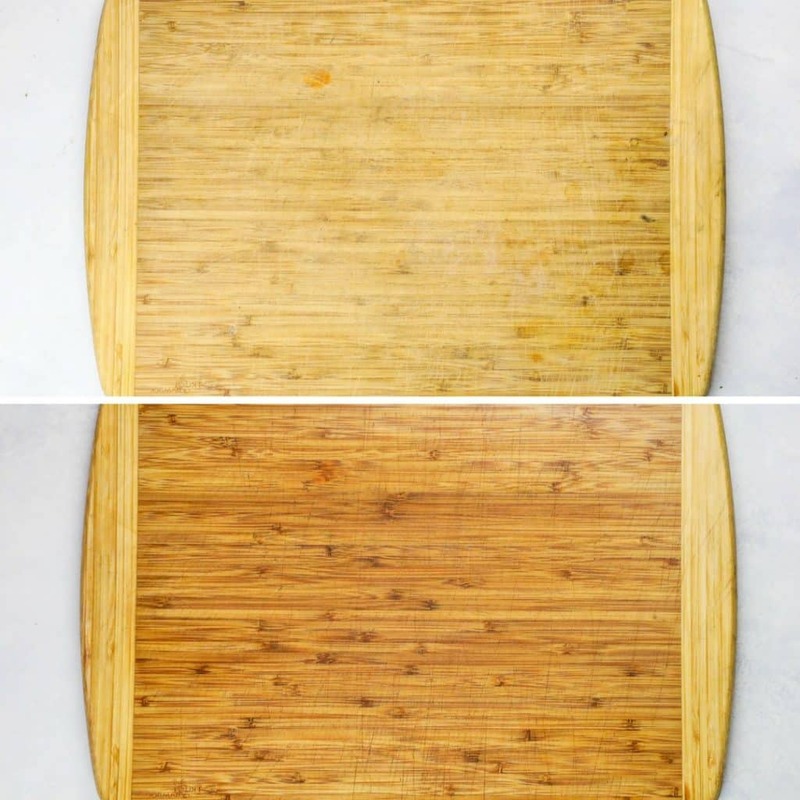 Today I am going to show you my foolproof, incredibly easy and chemical-free way of sterilizing wood cutting board surfaces, as well as how to restore or maintain an old cutting board to keep it looking rich and new instead of all dried out and sad. First off, check out our situation. We had a particularly nasty cutting board with food of some sort petrified on. Don’t judge. This is real life with two babies, people! To get the stuck on food off, take a regular old butter knife and scrape it down the board to remove any crusty bits. This will be the most labor intensive part of the process- make sure you really get all old crusty bits off and gone. Then wipe off any crumbs with a dry paper towel. At this point, if you have very deep cuts in the board, you might need to sand your board down. You don’t want deep cuts as they are harder to clean and can make an excellent hiding place for bacteria. We’re also VERY careful to not cut meat on our cutting boards- but vegetables can carry listeria and e. coli as well, so it’s important to clean often. Pour some vinegar on the cutting board (enough to coat it) and let it set in for 10 minutes. When fully soaked in, wipe it down with a wet cloth. 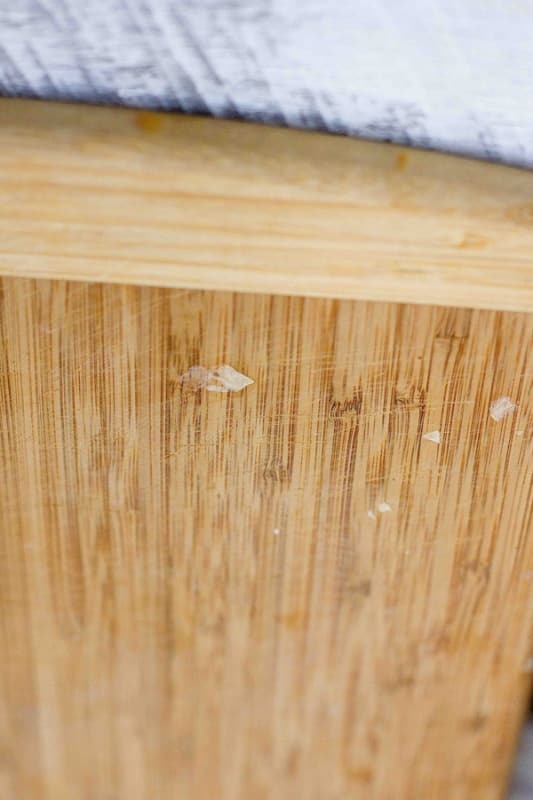 If your cutting board isn’t in need of a good sterilizing, or doesn’t have many deep cuts, you can skip the next step. Anything in my house, however, cannot. 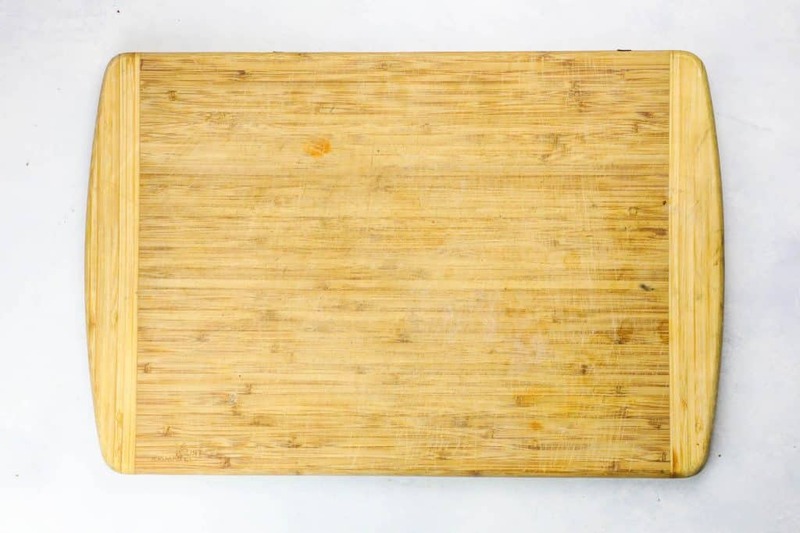 Pour a similar amount of hydrogen peroxide on the cutting board and rub it in to fully coat the board. Let it sit another 10 minutes and then rub clean with a damp cloth. Repeat the steps above for the backside, and let fully dry. You don’t need to wear gloves for this unless you are particularly sketched out by the smell of vinegar or you have any open cuts on your hands. Next, we’re going to get that dried out wood looking rich and beautiful as it was when you got your cutting board brand new. Pour a generous helping of coconut oil (food grade mineral oil also works) on the board and rub it around in soft circular motions. Think of this as lotioning up your cutting board– let it soak in the oil. If your cutting board soaks it all up immediately go on ahead and add a little more. Let it sit for about 10 minutes, and then using a dry cloth or paper towel, go over the board in circular motions to remove excess oil. 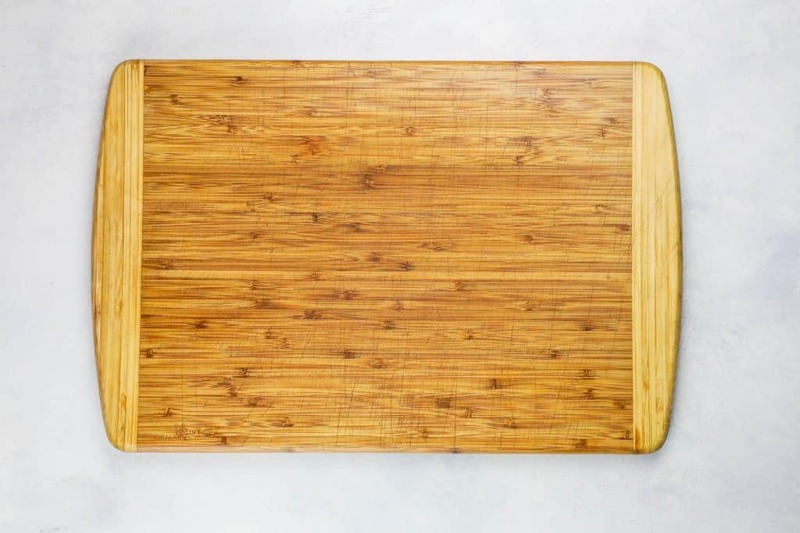 Don’t worry about getting it all up- it will continue to sink in to your wood- but you’d like it to not be a greasy mess all over your counter or wherever you store your cutting board. Repeat this oiling every week to keep your board well conditioned and to keep it from drying out- especially if you live in a very arid climate like here in Colorado! 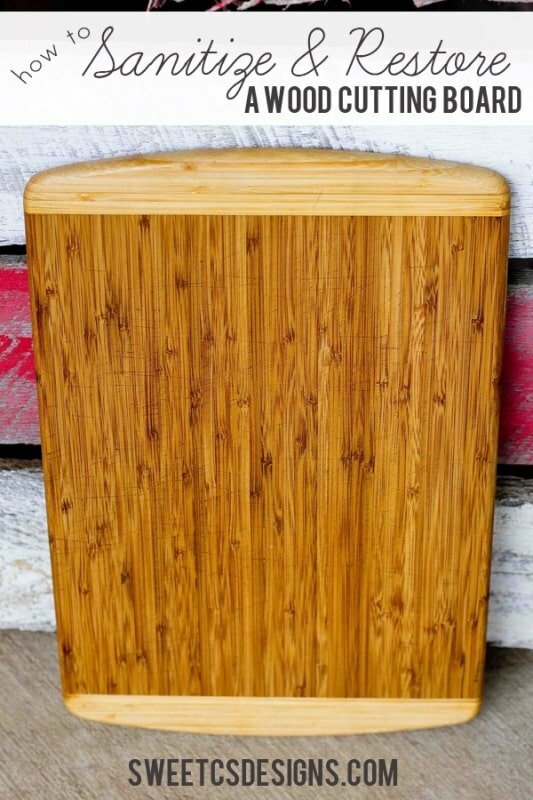 When you are done, your cutting board will look lovely and rich again!. 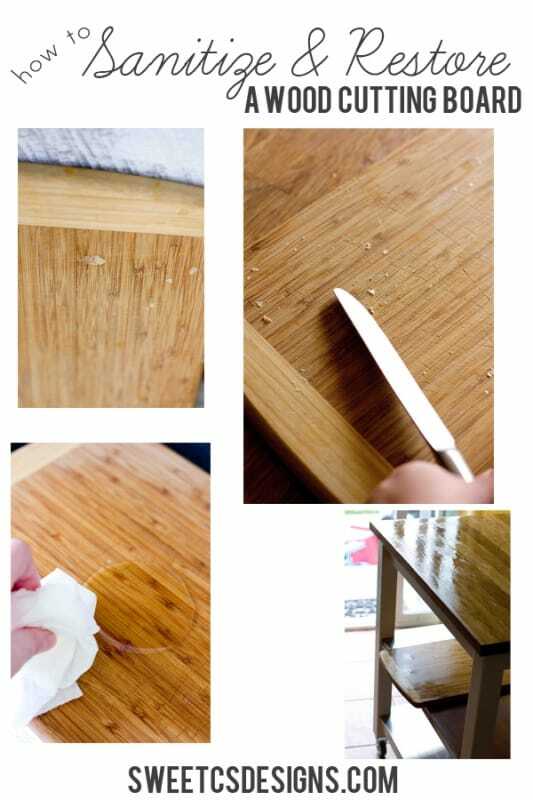 This can be done over and over throughout the years, as I do – if you look close, you can tell I am using the same cutting board in my pictures here from 2017 as I did way way back in 2014! Notice a little bit of my photography style has changed? lol 😉 – be kind! What will you use this awesome tip on? I’ve always wanted big long butcher block countertops, but was always afraid they’d get too dirty. Now that I know how easy it is to clean them, I’m off to dreaming again!!! Previous Post: « Frappuccino Inspired Blended Coffee & Choffy! This might seem like a weird question, but what do you cut your meat on if not on a cutting board? I’ve never thought about the bacteria from it as a I usually just stick it in the dishwasher. Maybe I have always been doing it wrong! I do have one wood cutting board I use for meat, but I usually just use a glass or plastic cutting board for meat instead of wood since I can pop those in the dishwasher without them drying or taking on a weird detergent flavor. I always thought you wiped them down with Clorox and let it sit & then rinsed it. Correct me if I am wrong. You can certainly do that- but I know lot of people like to not use bleach on surfaces they eat on. This gives a bleach alternative! You aren’t wrong according to the FDA & NSF & EPA (man there’s a lot of those 3 letter groups!) instructions. But within the past few yesrs more people have done their own research, really digging into germs & eco-friendly, non-toxic disinfection/sanitization methods & have found some equally as great alternatives since some people don’t like to use bleach near food items or at all. It is definitely your choice and don’t let anyone ever make you feel badly for whatever you go with. Your choice is personal. For me it is a personal decision as to whether or not the germs, bacteria etc that the bleach kills are better or worse than the ingredients & effects of bleach & using sparingly- a bit of bleach here and there when really needed. I am chronically ill and have to be extremely careful with germs for example. I am going natural BUT time will tell if maybe that isn’t the best choice and I still need some things to be deep cleaned with an item like bleach to ensure I do not get sicker. I hope that made sense. So far with using a seperate glass cutting board for anything raw, and wood for the rest and I had tried a lemon and salt scrub on my board but will try this way now!! I have been doing great! I’m excited because I really want to have a greener lifestyle ESP in the kitchen. Sorry for the long answer lol. Just did a LOT of research in that area bc I was all about bleach before. Thank you SO much for this tutorial. It is so helpful!! That is really awesome and useful information, Tara! I have an autoimmune disorder so I get sick often and really easily, so I appreciate all of the work you put into this! I will admit, I often just go ahead and use bleach, then let it air out. Sometimes I will use bleach and then follow through with the steps in this post to get rid of the bleach smell, and then re-condition the wood heavily after doing so (bleach can really wreck wood.) Also, using glass is my go-to for meat, I really only use wood on fruits and vegetables! While many people do use wood boards for meat, it just squicks me out too much. Great tips here. I am restoring a 1920 apple cider press. Naturally I will use my own cider viniger to clean before and after taking the hose to wash off the wood. mixing in beeswax should seal moisture the preserve. this beautiful primitive working press. Great article! Thanks. Can this work for wooden utensils (spatulas, spoons, etc.) as well? Is there another oil that you can recommend that is more natural? ie coconut, olive, etc. does it have to be mineral oil? can another type of oil be substituted? You can use coconut as well. I’m adding that to the post now! So, where do I find Food Grade Mineral Oil? I have been using bleach to sanitize mine! You can find it at walmart, target, grocery stores- you might just have to ask what section each store stocks it in. Sometimes I’ve found mineral oil in odd places since it is used for so many purposes. Thank you. But, will it say on the label “Food Grade”? I have to be VERY careful as I am 72 and a Cancer patient. I found mine in the pharmacy section. People use it as a laxative. Anyway the important thing is that it is made to be consumed, so I think it would be safe for your use. Bob, the Heavy Mineral Oil from the Pharmacy is safe. A friend of mine drinks some daily, and she is 87. Mineral oil is also called Liquid Paraffin in some countries. You can find mineral oil in a pharmacy, that is safe to use on your cutting boards. I use a lot of vinegar for cleaning.They now have a cleaning vinegar that is 6%. It woks great! great information, most people don’t really know how to take care of their cutting boards. 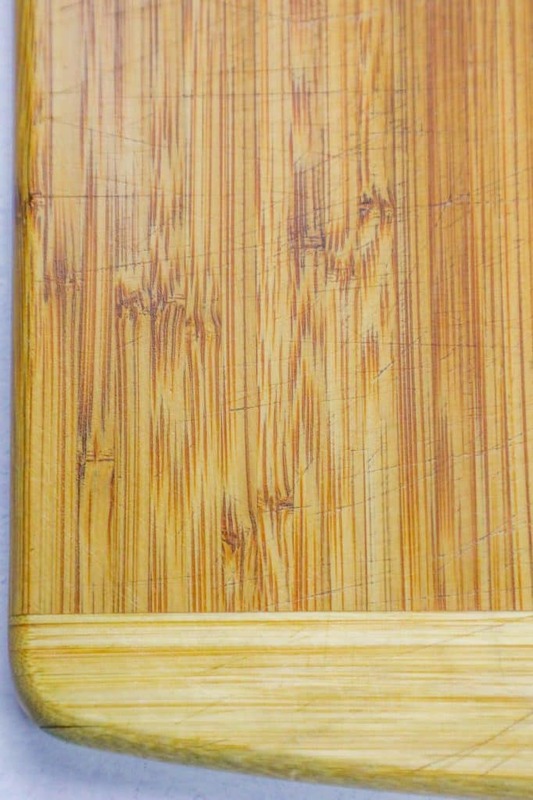 I have been making cutting boards for years and all I use is foodgrade mineral oil and then I topcoat with my minerail oil and beeswax mixture. I like your site,.. especially the recipes. Thanks for this! I use vinegar often but haven’t done the hydrogen peroxide – I should – and we have butcher block oil here, I use it for my wood counters as it’s food safe and all. This is great! We have the same cutting board and yours looks way better than mine now! Off to go restore my cutting board! What a change…looks great. Much healthier too, I’m sure. LOL. Great post and no judging… my babies are big and we still have mystery stuff stuck all over the place. Thanks for the great idea.